With the awesome weather that we have been blessed with lately, I have been chomping at the bit to get out on the river. It doesn't help that my daily commute takes me along both the Juniata and Susquehanna Rivers, so I am constantly watching the water conditions and observing anglers fishing at various locations. Over the past couple of weeks, the water levels have been receding from previous high flows. And as the levels have dropped, I have noticed the number of boats (and anglers) on the water increase exponentially. Last week, every day on my drive in to work I couldn't help but think, "It's November, the water is cooling, and fish are fattening up for the winter. Lots of guys are out there and I haven't been... Something special is going on and I'm missing it!" Needless to say, after working 7 days straight, when I finally had a couple of days off this past week it was time to fish. Dad and I had been talking about hitting the river, so I knew he would be up for it also. This past Tuesday morning we headed out to the river, with high hopes of finding some bass and maybe a couple walleyes. The morning started out a little bit slow, but before long we were picking up a few fish. After we reached the end of the stretch that we typically fish, we decided to head a little farther upstream to see what we could find... Luckily, we found a very nice looking hole. The hole was made up of a deep eddie against the inside bank and a strong current seam on the outside that pushed up against (and then around) a floating dock/log-jam at the bottom of the hole. It was a beautiful spot, and we were both pretty sure it would hold a couple fish. Sure enough, on my first cast I was on. 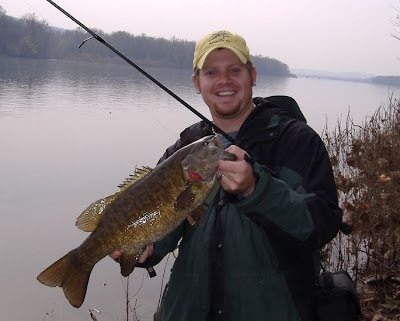 After a short struggle, I landed a nice mid-teen length smallmouth... We both took a few more casts with only a couple bumps (but no fish) to show for it. Then, BAM, I had a nice hit as I bounced my jig along the current seam towards the back of the hole. Immediately the fish took off fast, and headed for the logs at the bottom of the hole. I put some extra pressure on the fish and luckily it turned and came back upstream to the upper end of the hole for the remainder of the fight. I knew it was a good fish, but not until I saw it did I realize it would turn out to be my new personal best smallmouth... When I finally grabbed her, I couldn't believe how big she was... She was colored up beautiful, and was thick and very long--measuring 21 inches in length. If I had to guess a weight I would probably say 5 lbs or a bit better. We took some pics, and then got her back in the water and watched her swim away. Dad and I each took a couple more casts after that, but we quickly decided it would be tough to top what just happened... so we decided to call it quits and go check out a different spot. The move turned out to be a good one. 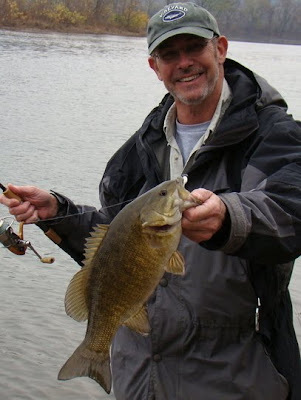 It wasn't long before Dad hooked up and landed a beautiful 18" smallie at our new spot. A few minutes later, I had a good hit that ended up with a wiff on the hookset... my leader was bitten off! Musky! I re-tied (put a plug on this time) and began fishing some more. About twenty minuted later I had another strong hit, followed by a wiff, and another bite off. This was getting frustraiting, lol. Next I bumped up the strength of my leader in case this were to happen again. Luckily, on my next strike the hooks found their mark and my line did not part. I fought the fish for a few moments and when I first saw the fish I though it was a small musky.... but I was wrong. The fish turned out to be a nice northern pike. The first one I've ever seen or caught in the river. After the pike, our attention was quickly turned to walleyes as I picked up a couple small ones and then my Dad landed a hefty 20 1/4 incher. We fished a bit more, but we were both very satisfied with how the day had turned out. So we decided to head home in the early afternoon. With the excitement from our trip on Tuesday still fresh in my mind, I had to hit the river again before I headed back to work Thursday night. Thursday morning I woke up early and couldn't get back to sleep... I was thinking about Muskies. I called my Dad to see if he could hit the river with me, but unfortunately he couldn't make it. So, I packed things up and headed out by myself armed with my rod and camera. As most of you probably know, muskies are supposed to be the fish of 10,000 casts... But as luck would have it, I hooked up on my first cast this morning and landed a pretty, little, hammerhandle musky--about 22 inches long. I was excited to land the musky, but was also kind of worried about catching a fish on my first cast... which has almost always provern to be a jinx in my previous experience, lol. Lucky for me the jinx didn't stick this morning. After about another hour of casting I hooked up again, but this time the fish was larger. It was long and broad, and as soon as I caught a glimpse of the fish in the water, I got nervous. It was an awesome fight. The musky took line fast, and it even leaped completely out of the water and did a flip...twice! After a couple of minutes and a lot of praying that my hook would stick and my flourocarbon leader wouldn't part, I slid my musky up onto the bank. She taped out at 33 1/2 inches and was very heafty for her length. I would have guessed 12 to 13 lbs. at the time. After a quick photo, she made a quick flop and was back in the water and gone in a split second. I was extatic, and after a deep breath I could feel a little quiver in my knees from the anxiety of the fight. It wasn't a big musky by any means, but it was the first nice one that I have caught in a long time. I fished a little while longer after landing the second fish, but I knew that it would basically be impossible for the morning to get any better, fish or not. So, I headed home a little before noon. I had caught the fish that I wanted to, and even got a couple pics... I was a happy, lucky fisherman. As always, thanks for reading and enjoy the pics!